One of the most traditional events during the holidays is a cookie exchange. If you've never been lucky enough to take part in one, you don't know what you're missing! What you do is arrange a get-together with your friends or family and everyone shows up with enough homemade cookies, brownies or other treats for the whole group. Then, everyone takes a few (or more than a few) of each variety, leaving at the end of the evening with an amazing assortment of goodies. Basically, it’s bring one, bring home A LOT. I am invited to a cookie exchange coming up at a friend’s house. 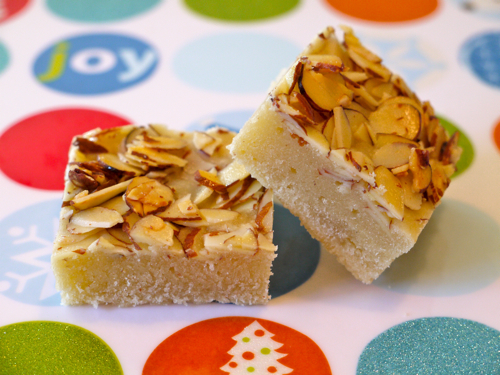 I want to make something a little bit different than the usual sugar or gingerbread cookies, so I'm bringing these Holiday Almond Bars. They're soft like a cookie on the bottom with a crunchy almond topping and no refined sugar, making them a refreshing change from the sweets you're used to this time of year. Perfect to give as a gift for your little one’s teacher, as a unique surprise for a cookie party or just as a treat to share with you kids, these bars are a special treat that may just become a new holiday baking tradition for you! 2. Place flour, salt and nutmeg in a bowl and stir to combine. 3. In another bowl, whisk together egg, honey, butter and vanilla. 4. Combine the dry ingredients with the wet and stir. 5. Place batter into a 7×11 inch baking dish lined with parchment paper. 6. In a bowl combine 1 tbsp of honey with 1 tsp of water to loosen the honey, and toss with the almonds. 7. Sprinkle the almonds on top of the batter to cover. 9. Cool, cut into bars and serve. Those look wonderful! Thank you for making them with no sugar! I can't wait to try them! Looks yummy indeed! And without sugar this is clearly my healthiest cookie of the month. Wonderful, wonderful! Thank you for such a wonderful recipe! My father is allergic to chocolate and when I showed him this recipe this morning he smiled and said ooh chocolate free brownies! How did you slice your raw almonds? or, do I just buy the sliced almonds? Thanks for this recipe, especially with no sugar. These look amazing! I buy them at Trader Joes raw and sliced. Most groceries carry them this way too. If only I could send this in my son's lunch. He LOVES all nuts and this is a great 'treat' without being too unhealthy. I am starting a campaign at our school to allow nuts and have a nut-free lunch area. Any thoughts on using an alternative to wheat flour in these? They look really yummy but my son's just been diagnosed with a wheat (not gluten) allergy. Can he have spelt flour. It would be a good substitute. I use it all the time! I have been using white spelt flour for all of my Christmas baking. I have used it for shortbread-based squares and my very discerning young adult kids said they could taste no difference and the texture was the same. I very successfully use whole spelt flour for every-day baking such as muffins. Ok, this might be defeating the purpose of creating a healthy cookie/bar, but what do you think of the idea of adding chocolate chips to the batter? What about using Almond Extract in place of Vanilla? sounds amazing! I would add the vanilla too! Made these earlier this week and they were a big hit with the adults and kids. And I didn't feel guilty letting my little one have seconds. These were really tasty, but I can't help feel like something went wrong. I made exactly to the recipe (using honey, not agave), and I barely had enough batter for thin 1/4\" bars in an 8x8 pan. It would have never covered a 7x11. These are foolproof. I ran short on honey and grabbed the maple syrup (the real stuff) to use too. Also was short on the flour and topped off with bread flour! Substituted almond extract for the vanilla. All in all, they are very good! Not overly sweet. Used a 9 X 9 baking pan. Thanks for sharing! how far in advance can I make these? Are they \"freezable\"? I added 1/2 tsp. almond extract and 1/2 tsp. vanilla to replace the 1 tsp. vanilla. Added a more almond flavor. Really rich \"cookie\" but delicious. Thanks Catherine! I used Almond flour in place of the regular flour and they turned out delicious! He’s together fine and were a big gluten free hit!